During surgery to remove the gallbladder (cholecystectomy), you may have a procedure called intraoperative cholangiogram. Cholecystectomy is the preferable operation for acute cholecystitis. This surgery is performed laparoscopically in about 50% of patients. The advantages of laparoscopic surgery are shorter hospital stays and quicker recovery. The most common complication of laparoscopic cholecystectomy is injury to the Common Bile Duct. Deciding on whether to do an open or laparoscopic cholecystectomy depends on several factors including surgeon preference and skill, as well as patients’ history of previous abdominal surgery and overall health. Common duct stones are discovered in about 15% of patients with acute cholecystitis. For this reason, an intraoperative cholangiogram is usually done during surgery and common bile duct exploration is performed if necessary. If a stone is discovered near the distal part of the CBD, ERCP may be used to perform a sphincterotomy and stone extraction. During intraoperative cholangiogram, the doctor places a small tube called a catheter into the cystic duct, which drains bile from the gallbladder into the common bile duct. A dye that blocks X-rays is injected into the common bile duct, and then you will have X-rays taken. 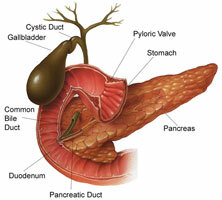 Look for gallstones that may be in the common bile duct. Allow the surgeon to see the anatomy of the bile duct system from the liver to the small intestine. Viewing the bile ducts before removal of the gallbladder may help ensure that the surgeon does not accidentally cut or damage the common bile duct. Damage to the common bile duct.